Hey y’all! One of the “problems” that always seems to be brought up in discussions on modesty is that it’s difficult to work outside and do hard tasks in feminine clothing. That’s exactly the myth this series will be trying to dispel. Today I woke up feeling like I am getting “the cold”. Since I wasn’t up for doing computer work, I figured it was a good day to get some Vitamin D, chill out and listen to podcasts, and get something done that always gets pushed to the bottom of the to-do list…. bush hogging! I had never heard of bush hogging until we moved to our land 5 years ago. It’s basically mowing with a great big blade attachment that you pull behind the tractor. So, I spent 5 hours driving the very warm tractor through waist-high weeds in the cow pasture. I prefer to do this in long jeans because the tractor gets so warm near my ankles that it can hurt if my legs are bare. I chose to wear tennis shoes instead of work boots because I had to walk up and down our big hill to and from the field, which is super tiring in heavy boots. For modesty, I wore this long shirt with a tank underneath. I have always had a huge aversion to “tool belts” and things that are super ugly but incredibly practical. But, common sense is slowly taking over and I’ve finally realized it is so much easier to clip my phone onto my belt while using the tractor than to stick it in my back pocket all the time. I’ve been listening to a ton of podcasts, so this set-up allowed me to plug in the noise-cancelling headphones and easily switch between episodes. I also wore my gun in case of snakes. The yellow on my wrist is a hairband I used to put my hair up in the warmer parts of the day. When I set out to bush hog this morning, I thought I’d be in and showered by 2pm, so I opted to leave off my make-up and put it on after that. But, dead battery, flat tire, a trip to the mechanic, and a mowed field later, it was 7:30 when I finally showered. Girls, I want to keep it real here, so these are no make-up, no photoshopped pimples, no dressing-up, no fixing my hair, no taking off the awful cell-phone belt clip, no cute shoes, nothing special pictures. Just a real outfit I wore on a real day to do real things that were really real. I hope you enjoyed this first in the Farm Style series! I know I have some readers who have bush hogged… what do you wear to do tractor work? I absolutely LOVE what you wore! As someone who wears pants about 5 times a week, I am encouraged to see posts with pants every once in awhile. Keepin' it real is the best way to go! Super cute! I have an almost identical shirt and also listen to podcasts/sermons a lot when I'm doing big jobs. We don't do bush hogging here on our small farm but we do haymaking, yard work, and animal milking in the mornings and evenings.. I usually wear a denim skirt if the ground looks dry or jeans and a tunic if the ground looks particularly muddy. There is always a risk of getting caked in mud, having to chase a runaway animal or having to ungracefully vault over a fence in the wind, so pants are the easiest for me. I love seeing the "real" everyday parts of your life! I have never bush hogged, but I have raked hay and I know how hot the tractor can get in the summer! 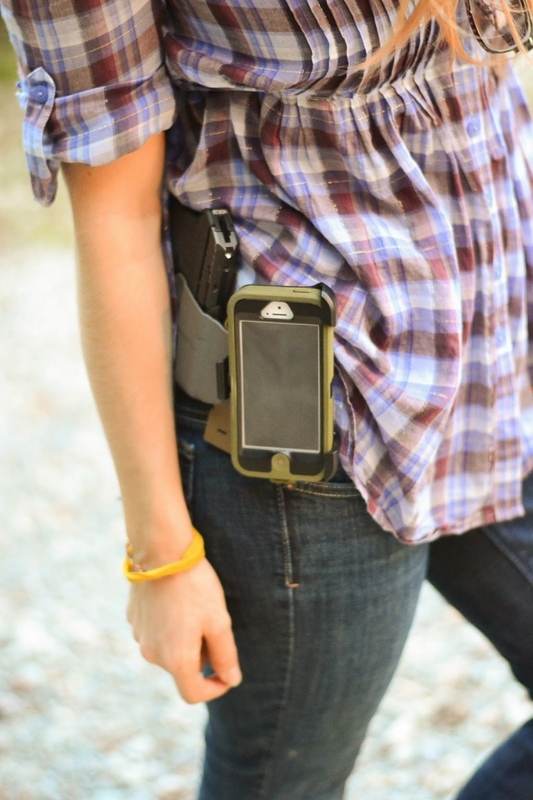 A belt clip for your phone sounds like a good idea, I may have to get one! I love listening to podcasts while doing chores and working in the garden. What podcasts do you listen to? What kind of clip/holder do you have for your gun? I've been trying to get used to carrying and so far I haven't found a holster I like that doesn't add a ton of bulk. It's kind of hard to conceal that way! 😉 Tunics would be perfect for conceal carry though! I look forward to more Farm Style posts! Thanks for sharing! Yes I am really looking forward to more of this series. That top is just so nice! Great post – love the practicality and ''keepin' it real'' 🙂 (though your other posts keep it real too!) Can I ask what you're carrying (or are you saving that for next Monday?) My husband looked over my shoulder while I read and saw your ''utility belt'' pic and wondered what make and model your piece is? Love this 🙂 Bushhogging is a big part of my life on my farm – also in Tennessee, woohoo! 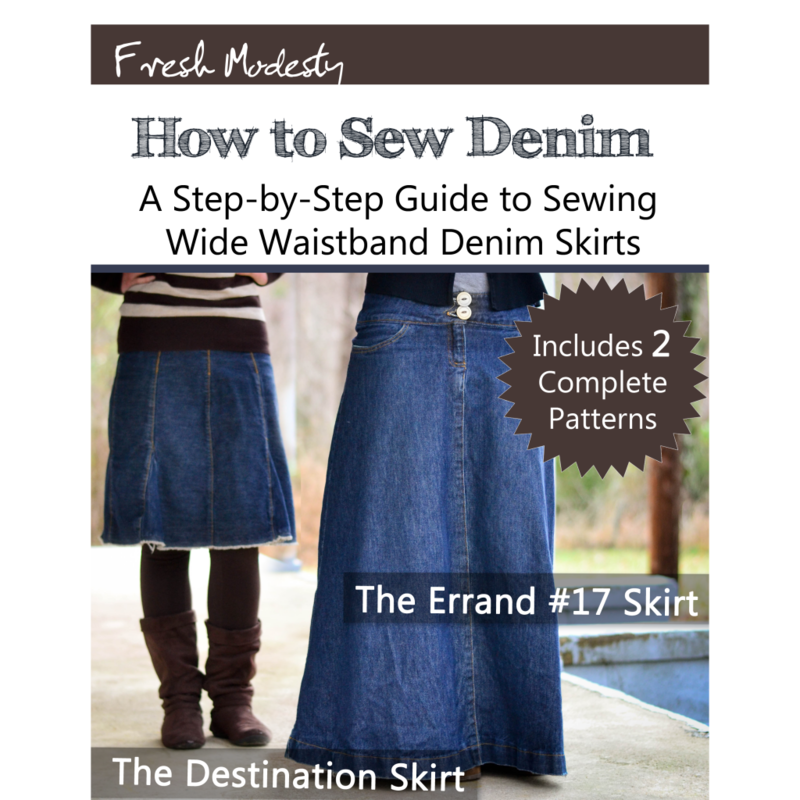 – so I love seeing these down-to-earth jean outfits that I can take some inspiration from. I typically end up in boots, jeans and a ratty t-shirt, haha! i live in TN too! I listen to sermons/ studies too!!! not on podcasts, but on the radio, sometimes 3 or 4 different ones 2 times a day. I used to think I was weird :). I've learned so much from them! ~Kelly M.
Love the reality of this one!! We all have "those days" when we just don't look like a princess and that's that. But, you still managed to look cute despite the challenges! Love it 🙂 This was also super encouraging as I wear pants quite a lot. So cute and practical! Hope to check out thredUP's sale. I wear pants pretty regularly, and am very encouraged by your pants posts! By the way, I'm sure I'm not the only one here who doesn't follow you on Facebook or instagram or anything. (I would if had a Facebook or instagram!) Are we missing out on important Fresh Apparel stuff? I was clicking around the website (great job, by the way!) and noticed some updates and surveys that I had never seen. I understand if you don't want to clutter this blog with stuff, but is there somewhere else we can go to see updates? I'd never heard I bush hogging! I thought at first it had something to do with pigs or something, mountain girl here. And just so you know, you look equally as pretty without makeup as you do with makeup. You look really nice. I love your top. I would have guessed you were going grocery shopping or something. When I would mow grass, I usually wore my grubbiest clothes. It was kind of embarrassing tho, when unexpected company comes. I was wearing an old t-shirt and bleach spotted shorts to mow when the census take stopped by to verify our family info. I wanted to hide, but I had to talk with her. I love this series! I know I don't look that great after riding horses or cleaning stalls but you do. My hair would stay nice if i was sweating for hours. The gun made this outfit and you like 100x more awesome. 🙂 Thanks for keeping it real. I'm terrified of snakes and we have some pretty poisonous ones around, so I'm definitely going to attempt to shoot one if I see it. Harmless snake maybe not. That is so cute! I love your top! I can't believe your not wearing make-up! You look so pretty! This post was great, Olivia! 🙂 It's fantastic to see the ways to be modest while working hard outdoors. Thanks for being real with us… I wear skirts as a rule, but I love how you pair long tunic tops with jeans for outdoorsy things. I'm used to working with a skirt on, but I love the practicality of your outfit so much! Blessings! Yay! This post was one that I was particularly looking forward too! I love the idea of a tool belt for phone, etc. Will have to look into one of those! 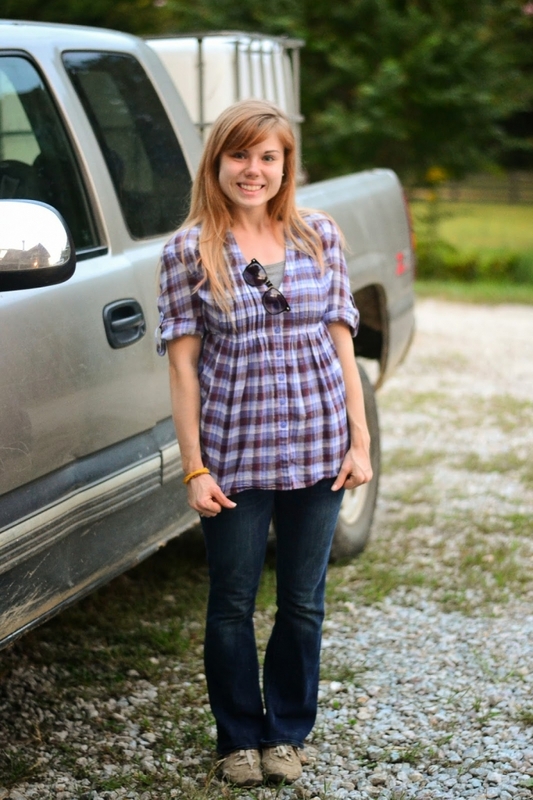 😀 I intern at a friends farm and have several other friends who are country folk, and I choose to wear jeans, mud boots, and old t-shirts when driving tractors and working with animals, mainly for safety reasons. Sometimes the animals are bothered by blowing fabric… Not to eager to have a rooster attack my leg 🙂 When I do wear a skirt for farm work, it is a heavy denim… durable for even roosters 🙂 Usually when I am gardening, I am more comfortable in a loose skirt. (Helps to eliminate the bend, pull, tug routine 🙂 Oh, and I loved seeing you carrying your pistol! Thank you so much for adding this series! I so enjoy reading this blog! I love reading your blog. When I do farm work, I usually wear long pants, usually jeans, and a somewhat loose t-shirt. I like to wear skirts when possible, but pants feel safer working around machinery and in the wheat and hay fields, the grass doesn't eat me up as badly. I really liked that you were open about carrying. In the country it is necessary for safety. Thank you for your blog and may God allow you to continue being an inspiration. Olivia, I just have to say that I was encouraged by this post. It is so good to see a young lady at home, dressing modestly AND femininely, and doing real hard work. I just think that this is really what it's about . . . this is Proverbs 31 in the twenty-first century. Love how you've capture all of that in this outfit. I agree! Keep up the good work! My gosh you are so pretty! I love the new layout on the blog! 🙂 I have been a long time reader and it's been amazing watching you grow up and going in the way of the Lord. I'm opening up a shop on my blog for lotions, lip balms, sugar scrubs, etc., so I would LOVE it if anyone would come and look! 🙂 thanks! There is NO WAY you look that cute without makeup and with no done hair?!?!? Oh my word! You look amazing! 😀 Great post! I never bush-hogged when we lived on the farm, we had a friend do it, or my brother or dad. But whenever we had our chores, milking the goats, getting eggs, feeding all of the animals, and all that, I normally wore just jeans, a long T-shirt, or something. I would keep my hair up in a braid or ponytail, something to keep it up. Love your outfit! Great post Olivia! I saw your were cc!! 🙂 A tunic is a great idea to help conceal!! I've really been struggling w/ how to stay feminine and yet still carry! Thanks for the post! I have a shirt just like that, only it's pink and flowery. 😛 Cute outfit! Just curious, what are your thoughts on skinny jeans? Have you ever thought about doing no make-up Monday posts? 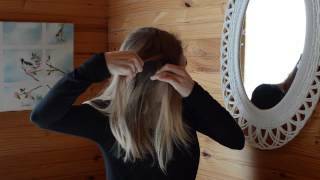 BTW- what's your secret to keeping your hair stay soo nice after all that work?! The concept of a girl carrying a gun is totally alien to a British person but on the other hand we only have one poisonous snake and that is now quite rare. I still don't wear jeans but I wear smarter trousers (which I think you call dress pants) to work quite often when it is colder and always try to wear a tunic or long cardigan with them to increase modesty thanks to your inspiration. Do you ever wear dress pants or just jeans when you do outside work? Thanks for keepin' it real, Olivia! =) I am really encouraged by your posts on wearing pants modestly. You are a real inspiration! Love the outfit Olivia! It looks really pretty but also practical! Hahaha..Wow, you drive a tractor? Good on ya! I love it! Looks like the outfits I wear when I'm working on the land. 🙂 Thank you for your encouragement to young women- you are definitely a blessing!